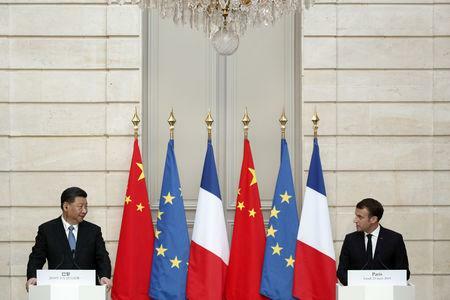 PARIS (Reuters) - France signed 15 business contracts with China worth billions of euros on Monday, including a 300-plane order with Airbus and a 1 billion euro contract for EDF to build an offshore wind farm in China, the French presidency said. The order from China for Airbus planes was the most lucrative of the deals unveiled in Paris, with a French presidency official saying it was worth about 30 billion euros ($33.94 billion). France's Fives and China National Building Materials Group signed a 1 billion euro deal to cooperate on energy savings in developing countries. Shipping line CMA CGM and China State Shipbuilding Corporation signed a 1.2 billion euro deal to build 10 container ships. CMA CGM, which is based in the southern French port city of Marseille, said the order comprised five vessels powered by liquefied natural gas and five to be fitted with so-called scrubbers to reduce emissions. CMA CGM had ordered in 2017 nine LNG-fuelled ships from China State Shipbuilding Corporation in what was the first such deal for large box-ships using LNG. In agriculture, France and China struck an agreement to lift an embargo on French poultry exports. The accord, which set out terms for exports of frozen French chicken exports, would end an embargo imposed by China following bird flu outbreaks in France. The move comes after last year's agreement between the countries to end a ban on French beef exports to China, an embargo that dated back to a bovine spongiform encephalopathy (BSE), or mad cow disease, crisis in Europe two decades ago.